Two vinyl releases were out for Record Store Day and some upcoming novels to celebrate 50 years of Lethbridge-Stewart. Ah, series 6. We’re not shy in our views of this series as a whole so can this Moffat story restore some faith? Plenty of the Doctor’s friends are onboard for this resuce mission story but does it feel like a good team effort or are there too many cooks in the kitchen? Thank you for joining us for 185. Next week we’re back to The Sarah Jane Andentures and Revenge of the Slitheen. Have a great week and until next time – Allons-y! Titan Comics announce a three part series starting in July labelled as “The Road to the Thirteenth Doctor” and Forbidden Planet(.com) have a great sale on Who t-shirts. We kicking off our first ever Torchwood review this week and starting in chronological order it’s the first ep. Lots to talk about and does it signal a welcome change for a Who spin-off or are we left out in the rain? Thank you for joining us for 184. Next week we’re flying to modern Who for the 11th Doctor story A Good Man Goes to War. Have a super week and until next time – Allons-y! The Third Doctor is back! Volume 4 of The Third Doctor Adventures sees the Doctor and Jo facing off against the Meddling Monk and his breed of Nu-Humans and the Cybermen on a distant planet. I came to this series a little hesitantly, not really sure if I was ready for anyone other than Jon Pertwee to play the Third Doctor. I had listened to Tim Trelor in the role before having heard some of the previous sets and some Short Trips. Now, I’m not against recasting members of the Who family. It is a sad fact that we loose beloved cast members with increasing frequency as they pass on to the big TARDIS in the sky. It worked brilliantly with Ben Jackson in The Early Adventures, with Elliot Chapman. But something has always stopped me from enjoying Trelor’s performance, it isn’t bad by any means but for me, it wasn’t Pertwee. So, you can imagine my surprise at how blown away by this set I actually was when I heard it! In terms of continuity, both of these stories take place not long after the events of The Three Doctors and The Rise of the New-Humans wastes no time to get going, quickly establishing the Doctor and Jo are investigating some strange deaths sweeping the country. Their investigations quickly lead the pair to a strange hospital which seems to be decades ahead of the technology in the 1970s. They also discover the presence of an old foe in the form of the Meddling Monk, now disguised as the head of the hospital. Guy Adams crafts the first half of this tale to lead you to believe that it is actually the Master who is behind this plot, as he often was back then and he gives the plot time to breathe and characters the room to grow as events unfold around them. As you can probably guess, there is a strong element of body-horror involved, with people trying to sprout wings and gills to survive different ordeals. But there is also a rather intelligent moral and ethical dilemma thrown in for good measure – would you, in good conscience, no matter what time you come from, allow someone to die when you could cure them? This is a question that has been posed before but never to this extent, the Monk even asks Jo if she could let someone with terminal cancer die when she could cure them. Adams seems to have taken a bit of inspiration from Evolution of the Daleks but has done this kind of story properly and has thrown in plenty of twists and turns to keep the listener guessing and he doesn’t reveal the real abilities of the New-Humans until the very end. The performances are also very good. Rufus Hound is, of course, brilliant as the Monk, devilishly lapping up the script with gusto. The Monk is such a far-cry from the devious Master and it is fascinating to see the Third Doctor interacting with a different Time Lord. Katy Manning is wonderful as Jo, effortlessly varying her performance from depressed mumblings back to her normal hyper-happy self. It was also interesting to see her interacting with another member of the Doctor species, especially given how much experience she has with rogue Time Lords! But it was Tim Trelor that surprised me the most. As I stated above, it was never his performance that I never liked, just the fact that the Third Doctor could never be played by anyone other than Jon Pertwee. But there were times when I could have sworn it was Pertwee saying the lines. Trelor has come a long way from Volume One, when he did a passable impersonation of the Third Doctor. He keeps it no secret that he has clips and episodes on his phone which he studies endlessly to get the manner of the Doctor and his studies have obviously paid off. In fact, I loved Trelor as the Doctor, he should be very proud. No doubt Pertwee would be. The Rise of the New-Humans is a cracking story, brilliantly written and acted, anyone listening will come out of this impressed. Tim Trelor, Katy Manning & Rufus Hound at the recording for The Rise of the New Humans. If I’m being honest, it was the idea of the Third Doctor and Jo meeting the Cybermen that swung this release for me. I can’t be alone in thinking that although he met them in the Big Finish audio, The Blue Tooth, the Third Doctor never got a decent chance to meet the Cybermen. But that is a fact no longer. Settling the action on a distant human outpost, Marc Platt, the man who gave us the fantastic story, Spare Parts, the Doctor and Jo find themselves in the outpost called Burnt Salt, the remaining humans all have secrets that surface as the surviving Cybermen, from the Cyber-Wars, make their presence known to retrieve their mysterious weapon, the Cyber-Leveller. Of course, it would be impossible to outdo Spare Parts but The Tyrants of Logic certainly tries too. There are just a few things that let it down. It feels so familiar, its nothing we haven’t seen or heard in Doctor Who before, characters appear to be willing to sacrifice their humanity to the Cybermen who have survived extinction yet again. The Doctor takes five to alleviate Jo’s feelings about the robots near-human nature and then there is the obvious ending to Episode Four. It just comes across as a run-of-the-mill nostalgia tour of Doctor Who’s greatest hits. If The Tyrants of Logic does anything, it explores what it means to be human. It does this by exploring our very DNA being evolved to a higher state and bringing us to the brink of having our personalities stripped away. It is still possible to define someone as a human being if our identity, personality, what makes us, us, has been taken away? This question is asked and answered brilliantly with Carolyn Pickles’ performance as Marian Schaeffer’s cold and calculating exterior is peeled away to reveal a heart-breaking secret. But if this story doesn’t exactly break new ground, it isn’t because the cast and crew aren’t trying. The script is a damn good one and Nicholas Briggs’ directorial guidance helps to provide an entertaining couple of hours worth of entertainment. The performance and chemistry between Trelor and Manning is just perfection. And the sound of the Cybermen’s head-guns from Revenge of the Cybermen was a welcome addition too! This was my first real trip into the land of the Third Doctor at Big Finish. While it was far from my first Katy Manning audio, it was my first proper, proper, experience with Trelor’s Doctor. And it was brilliant. The Rise of the New-Humans will no doubt stand as one of the best Third Doctor adventures in the audio format. And while The Tyrants of Logic, broke no new ground concerning the Cybermen, it is a worthy listen because it is the first proper meeting between Three and the metal beasties. What a brilliant trilogy of adventures this has been. Kingdom of Lies, Ghost Walk and Serpent in the Silver Mask have been a masterful set of trips for the Fifth Doctor, Tegan, Nyssa and Adric, a very underrated team from the television series. 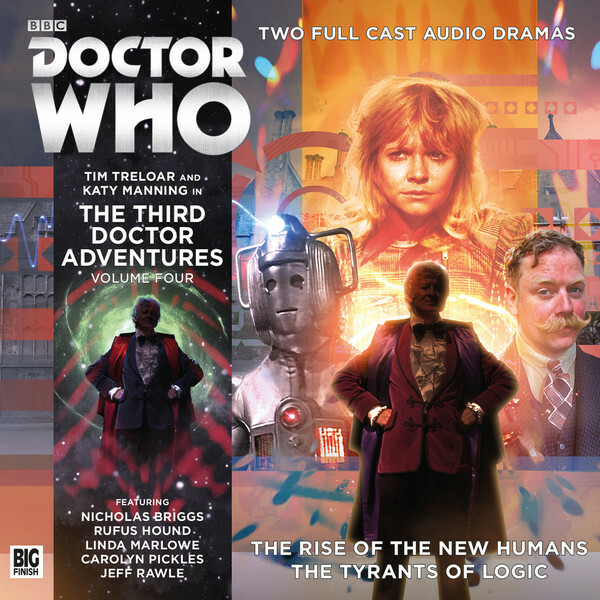 When I first heard that this was going to be a story, I immediately thought Big Finish were doing another story with the Mara. But then my mind went to all the continuity problems – the curse of being a Who fan is that we like our things to be in order – on television, the Mara seemed pretty exorcised in Snakedance. When it reared its ugly head in Big Finish’s Cradle of the Snake, an author other than Marc Platt would never have gotten away with bringing the baddie back. Luckily though, the Mara is nowhere to be seen in this story but there is a rather large snake involved! David Llewellyn has created a brilliantly imaginative and wholly original story with Serpent in the Silver Mask. The tale is incredibly engaging and immersive, especially with the whole Mazzini family being played by one man, Samuel West. In an interview Llewellyn said he got that idea from a movie where one actor played an entire family in a situation similar to this one. West proves himself to be remarkably adept at changing his voice or tone with the different family members and his performance seems to give each of them, no matter how brief their time, their own character and history. Whether he is playing a couple of oafish twin teenagers who are designed to be grating, even if it is a slightly unenjoyable parody of how teenagers talk, they are actually quite funny, or a desperate woman whose business is beginning to seriously flounder. Llewellyn kills a number of them off in incredibly dark but humorous ways and it could have all gone wrong had it not been for West managing to anchor them all in a way which allows the mystery of the Mazzini family to unfold in a natural way. What Llewellyn also manages to do is tap into the Holmesian aspect of the Doctor. He takes that aspect to such an extreme that the Doctor has actually deduced the real murderer long before anyone else, as had I, but he doesn’t tell anyone for ruining what he perceives to be fun. Llewellyn also manages to dispel any notion that the Fifth Doctor should be thought of as the most human and empathic of all his incarnations. His detachment at all the deaths happening around him enforces the idea that he just as alien as any of his previous incarnations. Peter Davison gives a brilliant performance that combines the more alien aspects of the Doctor with the more comedic roots of Davison’s career. 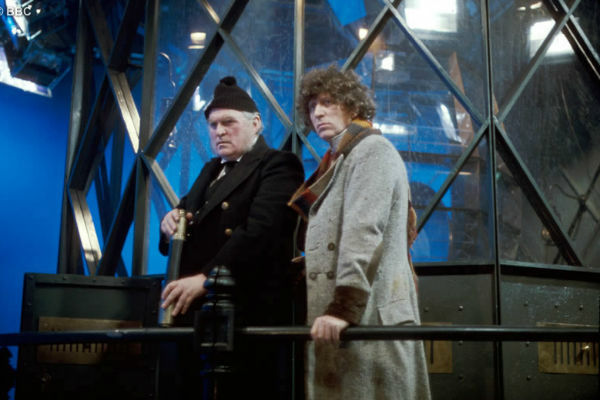 The Doctor throws himself into this mystery while also taking a back-seat behind bars to allow his companions to work out what is happening. 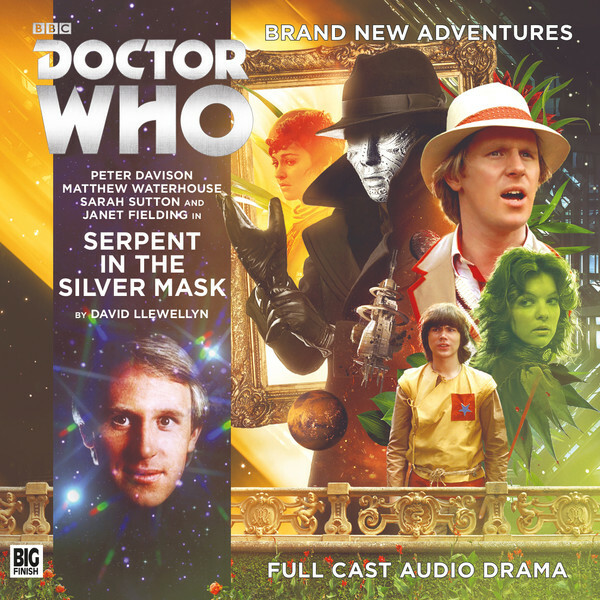 And Serpent in the Silver Mask manages to do what the television series never could, give all three companions something to do and something to contribute to the overall plot, particularly as they deal with the mystery differently to the Doctor. All the original performers give their all, Sarah Sutton is brilliant as usual while Matthew Waterhouse seems to finally have settled back into his role as Adric. But this story really gives Janet Fielding as Tegan a moment to shine with her flirtatious relationship with Joe Mazzini. With Samuel West playing so many characters at once, this story boasts a rather small selection of guest cast members. But those it does include do a good job too. Phil Cornwell features as the sardonic Superintendent Galgo and the robotic Zaleb 5. Sophie Winkleman is suitably stroppy as the secretary, Sophia who had previously worked with Carlo. Both actors help to flesh the story out, particularly as it reaches its rather Scooby-Doo-like conclusion, twisted with the science-fiction conclusion to the set of events. Fancy owning William Hartnell’s original script from An Unearthly Child? Well, you can if you have the monies as it’s going up for auction. Robert Harrop shows off their upcoming Mandrel figure. Nice. Back to classic Who for a 3rd Doctor story of time travel, mythical lands, characters and the infamous TOMTIT machine. Does this one deliver on its epic setting or does it flap around aimlessly like some kind of strange bird? Thank you for joining us for 183. Next week we’re kicking off our first ever Torchwood review so get Everything Changes watched and your reviews ready. Have a great week and until next time – Allons-y! Some serious talk on Chris Eccleston appearing at London Film and Comic Con and cons in general. Finally(!) the Series 9 soundtrack is nearly upon us and up for pre-order at Silva Screen and another new t-shirt from Forbidden Planet. It’s finally here! Many of you wanted it so here we go, our first of the Sarah Jane Adventures review. Invasion of the Bane was the “pilot” story released on January 1st 2007 and introduced us to the main characters. Does this spin off impress or are we feeling some déjà vu from a certain classroom-based spin off? Thank you for joining us for 182. Next week it’s back to classic Who and the 3rd Doctor for The Time Monster. Have a great week and until next time – Allons-y! Ah, Doctor Who and horror, two of my favourite things. When they come together, the scarier stories are often magic. And Ghost Walk delivers on that respect. When it was initially announced that a spooky story was on its way, I was pretty excited, Static was superb and I was highly anticipating Ghost Walk. And I wasn’t disappointed. Every now and again, Big Finish comes up with a delicious idea, they did it with stories like The Pirates and The Chimes of Midnight. And this is one of those stories with a delicious idea at its heart. It all begins ordinarily enough, its a normal night for Ghost Walker, Leanne, played with flourish by Fenella Woolgar, she has a group of tourists going around the local hotspots like the Screaming House, the Witch Pool and the Hanging Yard. he also has to keep her tourists away from her rivals. And she can see ghosts that no one else can. But Leanne doesn’t believe in ghosts. For some reason, the darker stories have always suited the Fifth Doctor, Earthshock, Ressurection of the Daleks and The Caves of Androzani all worked brilliantly on television because of their dark tones. It is obviously something to do with the Fifth Doctor being younger, brighter and chirper. Despite the over-lit sets of the eighties, many of the stories from the Davison Era had some quite grim worlds when you really looked. Trevor Baxendale’s novel, Fear of the Dark did much the same thing as Ghost Walk, taking the Fifth Doctor and making him face his worst fears. The loss of his friends, the loss of his ship and the loss of his favourite planet. In his interview for Doctor Who magazine and the CD Extras, author James Goss, a regular contributor to the worlds of Big Finish, tells us he got the idea for this story when he was doing a ghost walk. He was fascinated with the way the guide would talk to the punters, something which evidently stuck when he wrote the character of Leanne. What also helped was that the script editor, Guy Adams also worked as a ghost walker back in the day. With two people who have experienced both sides of that world, then it is little wonder that this story works so brilliantly. But there is so much more to Ghost Walk rather than the titled, ghost walk. Each of the companions is separated from the Doctor for extended periods of time and each one has a lot to do, giving each one a time to shine. On the television, the problem with the crowded TARDIS was evident. With one Doctor and three companions, splitting the stories up so that each one got things to do was difficult. One either got caught like Adric in Castrovalva, one got locked up or possessed like Tegan in The Visitation and one got sent to sleep like Nyssa in Kinda. It isn’t exactly the same problem for them on audio, though I should imagine it could be, indeed, Adric’s segments are shorter than that of Tegan’s and Nyssa’s but it is no less important. In fact, Matthew Waterhouse, much like he did in Kingdom of Lies proves to us that he has a talent for comedy. When he is arrested and threatened with deportation to Australia, is comment is laugh-out-loud. Nyssa finds herself stranded in the past and her story is a particularly dark one. Following on from a few years after the infamous Witch-Trials that plagued England and killed thousands, Nyssa finds herself flung right into trouble when she literally tumbles from the sky into a field. 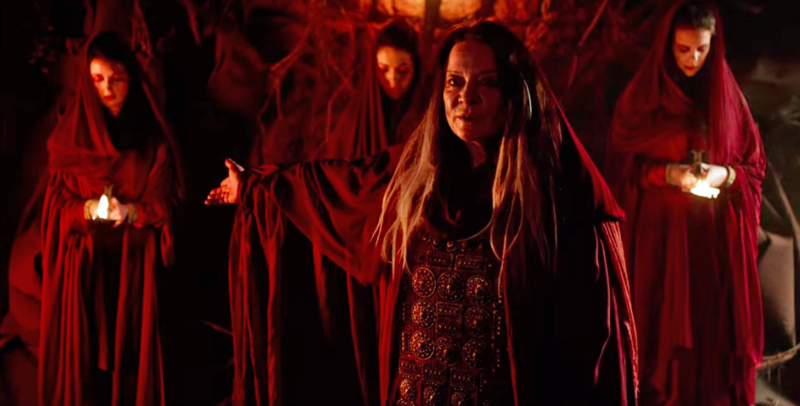 Saved from a fiery fate by the local Reverend, played brilliantly by Sacha Dhawan, Nyssa gets an interesting love story, something akin to the Autumn story in the anthology release, Circular Time. And just like Autumn, this one is just as heart-breaking. Reverend Matthew obviously has feelings for Nyssa and Nyssa has feelings for him too, but she knows that the Doctor will come for her, she just has to pass the time until that happens. Sarah Sutton obviously relishes the chance to play Nyssa out of her Florence Nightingale mode as she gets to get her hands dirty. 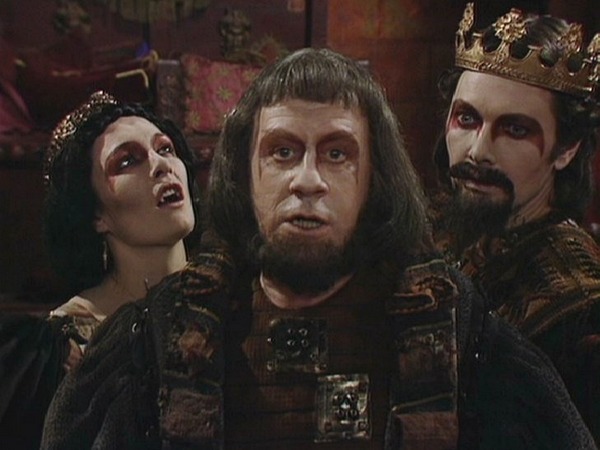 But the fates of both Adric and Nyssa are deeply disturbing and made even more uncomfortable by the fact that they aren’t resolved immediately. Janet Fielding gets to play a different side to Tegan too. 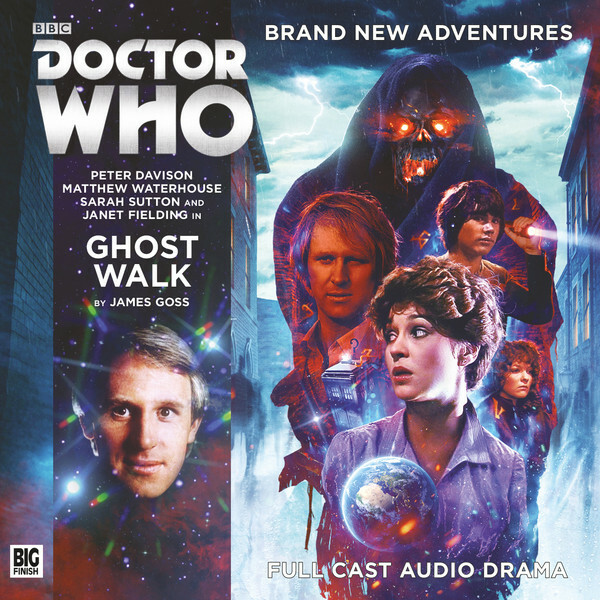 Ghost Walk sees Tegan as the voice of reason, someone who offers some snarky comments but shares a number of touching moments with the Doctor. And Peter Davison plays the Doctor with a dry wit, frankness and some quiet dignity. This is quite possibly one of his best performances since Spare Parts. The horror side of Doctor Who got the show into trouble with the notorious Mary Whitehouse back in the seventies and there is no doubt in this reviewer’s mind that if she heard this one, especially with a couple of the extremely disturbing cliff-hangers, she would have pounced on this quicker than a dog with a bone. This story would be brilliant in a prose format too, it is so suspenseful, foreboding and comes with a creepy villain. Speaking of creepy villains, Stephen Greif is brilliant as the demonic Saboath. He is deliciously creepy and his brotherhood are terrifying, despite all they do is chant! The guest cast is on fine form too, Fenella Woolgar, Sacha Dhawan, Stephen Greif and Carolyn Seymour all manage to create one of Big Finish strongest guest casts to date, aided with a particularly strong script and tight direction from Barnaby Edwards. Ignoring the dark tone this story takes, it is actually laced with some nice humour and banter. And it finally feels like Matthew Waterhouse is settling in nicely. Waterhouse had been doing some of his best work in the Dark Shadows and Short Trips’ ranges at Big Finish. Janet Fielding and Sarah Sutton had that report with Peter Davison from years of doing these audios. Ghost Walk marks a more comfortable beginning for this crew at Big Finish and long may they continue. This is a city of ghosts and no-one knows them better than Leanne. Twice a night she leads tourists to visit the most haunted sites – the Hanging Yard, the Witch Pool, the Screaming House, and, of course, the Catacombs.Leanne’s realised the ghosts of the city are real. Something’s lurking in the Catacombs – an ancient force that has been growing in the darkness for centuries. Sabaoth is returning and they must be stopped before they devour the world. Leanne knows this because a ghost told her. Peter Davison (The Doctor), Janet Fielding (Tegan Jovanka), Sarah Sutton (Nyssa), Matthew Waterhouse (Adric), Fenella Woolgar (Leanne), Sacha Dhawan (Matthew), Stephen Greif (Sabaoth), Carolyn Seymour (Mrs. Stubbs), Phillip Childs (Giles), John Banks (Louie) and Rebecca Tromans (Nancy). When you consider the longevity of classic Who there are many people that helped to cement its popularity in the common consciousness and for this article I want to put the case that Terrance Dicks is one of those people deserving of fans appreciation and respect. His name is synonymous with Who as a scriptwriter and writer extraordinaire and who knows where the show would have been without him. 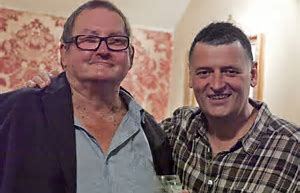 A couple of years ago I finished watching all the Pertwee stories in order and I remember on one of the extra features (I think it might have been the Daemons DVD ) seeing a very moving tribute by Terrance Dicks to his close friend Barry Letts who had passed away a few years before. 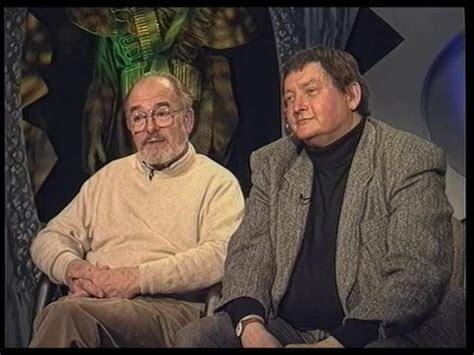 It really touched me because although Terrance Dicks and Barry Letts were very different they became great friends and together took the show to fresh directions with the departure of Patrick Troughton. I think the 3rd Doctor era when Barry become producer and Terrance was the script editor is a real highlight for me, one of my favourite times of the show. 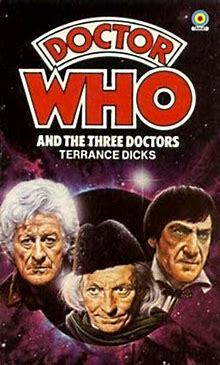 The feature also reminded me how much Terrance Dicks was a part of my Doctor Who childhood as well as an integral part of the success of Doctor Who. Through Hulke he was then introduced to an executive producer on Crossroads, which was ITV’s early evening television soap opera running from 1964- 1988 set in a fictional motel. It regularly attracted huge audiences with ratings as high as 15 million viewers. 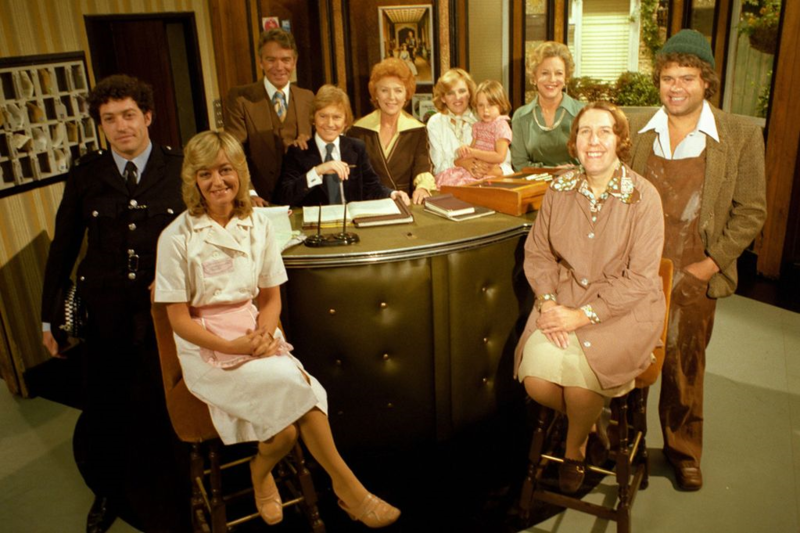 I remember in the late 1970’s/ early 1980’s as a child, coming home from school, and having dinner in our kitchen during Crossroads watching the hotel matriarch played by Noele Gordon and the unfolding dramas in the hotel. Our family bonded over dinner discussing Crossroads. Terrance Dicks worked on ‘ Crossroads’ for some time within a team including Derrick Sherwin who later left for Doctor Who. When Derrick Sherwin wanted to move on from Doctor Who he contacted Terrance to ask if he wanted to be script editor on the programme. Terrance accepted and when Derek didn’t leave straightaway Terrance undertook an apprenticeship under Derek which helped him transition when Derrick Sherwin and Peter Bryant eventually left in late 1969. As a script editor from 1968 to 1974, Terrance Dicks understood the ability to be able to write or change scripts quickly as required. The Seeds of Death, which introduces the Ice Warriors in 1969 was partly written by Terrance Dicks. Although Brian Hayles is credited as the author Terrance Dicks rewrote episodes 3-6 not considering the original ending by Hayles as strong enough. I rather enjoy the changes in pace in this story as we travel from Earth to the Moon and then the threat comes back to Earth. It is clearly a story of three parts- the attempt to get to the moon, what happens at the moon and coming back to earth which does keep it moving really nicely. I love all the characters, Radnor, Eldred ( the glimpses into their past relationship) , The formula of a commander onside with the Doctor is common but works ) Miss Kelly ( yes the very beautiful Gia Kelly ) Fewsham, ( his cowardice and redemption) Phipps ( helping the doctor) I enjoy the sheer fun of seeing Pat Troughton immersed in foam. This story being six parts does what Nu Who cant unfortunately and which I miss sometimes, It establishes the supporting characters beautifully and I love that. Of course, this story also introduces the Timelords and adds to the history of the show with the second doctor regenerating There is a moment I love the moment when the Doctor and the War Chief recognise each other. It’s a subtle moment as one-time lord knows another. There are other moments as we are introduced to SIDRAT’s (Tardis backwards! ) knowing how to remote control them, lovely little things building to finally finding out who the Doctor is and seeing his people. I have to also mention Philip Madoc as the War Lord who is superb in his role. My absolute favourite scene is when he confronts the War Chief. There is a quiet chilliness in his conversation compared to the War Chiefs bravado and you know the War Chief won’t escape from him. He literally turns his back on him.The last two episodes are such good drama and really well written by ‘Uncle’ Terrance and Malcolm Hulke.There is an interesting scenario given that the Time Lords are all powerful, creating force fields, telepathic boxes, burning light from their eyes which I don’t remember ever seeing again which is a shame. What I love about ‘ The War Games’ is its scope get gradually bigger and bigger until you get this really satisfying conclusion. 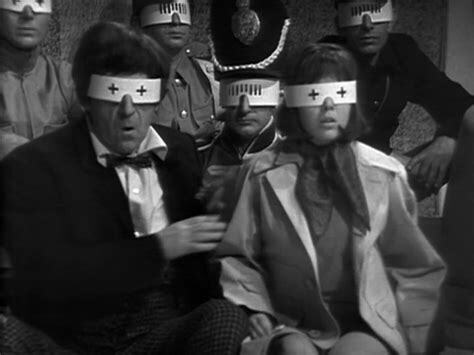 Zoe and the Doctor in disguise in the epic 10 part ‘ The War Games’ written by Malcolm Hulke and Terrance Dicks which introduced the Doctor’s people. The seventh season brought many changes which I personally love. The move to colour and the regular inclusion of UNIT in a familiar setting made something more sophisticated, grown-up about the stories for most of this time. It made sense for the organisation to exist as the threats came down to Earth and to have the Doctor assisting as a scientific advisor for UNIT.Being exiled to Earth by the timelords meant that the doctor needed to have some roots which UNIT gave to him.Terrance Dicks wasn’t the original creator of UNIT but the organisation gave the doctor a substitute family and his assistants became natural companions. Jon Pertwee’s ‘ action man’ 3rd doctor confronting authority certainly added to the aura of the show.It felt slicker somehow. What I didn’t realise is that the earthbound setting characterised by the Pertwee era wasn’t a Letts/ Dicks idea. They were ideas by Derrick Sherwin and Peter Bryant who had also set up the seven-part stories format of Pertwee’s first season. Both of these ideas were cost saving ideas which had been developed to save money by creating alien planets every week. Terrance Dicks as incoming script editor and Barry Letts worked on the practicalities to eventually move away from these restraints and the third Doctor did get back into space. One of the greatest legacies from Terrance Dicks that has been seen is all the different characters and concepts he has introduced, He has had the knack of creating concepts that have become woven into the history of the classic series such as the War Lords, the Game of Rassilon and the Death Zone (with the marvellous Raston Warrior Robot ) expanding the background of the Doctor, time-lords and his homeworld. Terrance Dicks has looked to literature for inspiration and the Conan Doyle stories provided for one of the greatest concepts, an arch-nemesis, the Master to be as a recurring villain for the Doctor. He was created as an equally matched adversary, with sociopathic tendencies always in a battle of wits with the 3rd Doctor.The Master’s title was chosen by producer Barry Letts and script editor Terrance Dicks because, like the Doctor, it was a title given to an academic degree. The character first appeared in Terror of the Autons in 1971 until 1973 played by Roger Delgado, who was a good friend of Jon Pertwee and had worked previously with Barry Letts. Terrance Dicks recognises that the Master was over-used in Season 8, being the main villain in every story. 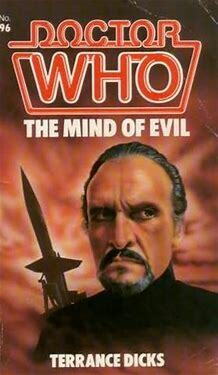 However, the Roger Delgado version is often acknowledged as the definitive version of the character. The popularity of the character speaks volumes when we see how two showrunners in the modern series have utilised the Master as the returning big villain. Series three has possibly one of the greatest cliffhangers ever in ‘ Utopia’ when Professor Yana is ‘revealed’ as being the Master and regenerates and goes on to rule over the Earth for a year. Whilst I wasn’t keen at all on the Missy Master in ‘Death in Heaven’ penned by Steven Moffat kissing the Doctor the examination of friendship and rehabilitation of Missy in series 10 playing on the former friends aspect of the character made the series much stronger for that exploration so it really is all about the writing. 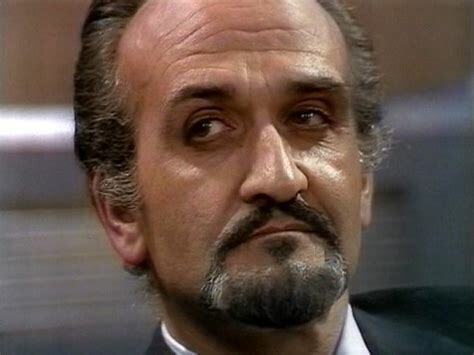 Roger Delgado : the definitive Master? What I love as well is that the themes of everyday things being terrifying started properly with the third doctor era and it’s a something that has been also actively mined in the modern series. Both Terrance Dicks and Barry Letts were part of making the threats come nearer to home. It became a very popular formula and secured the show’s future. Jon Pertwee is often quoted as saying ‘ There’s nothing scarier than coming home and finding a yeti on your loo in Tooting Bec’ In the seventh season most of the invasions were either inside the Earth, coming from the seas or coming from the skies above the Earth. There were Sea Devils, Silurians, meteorites. In the ‘ Terror of the Autons’, the Master teamed up with the Nestene to create living plastic dolls and killer inflatable plastic chairs. ‘Spearhead In Space’ saw terrifying policemen, plastic shop dummies and these images were imprinted in the public consciousness. Russell T Davies lovingly crafted his first episode of the new series ‘ Rose’ using the same iconic imagery that was there originally in ‘Spearhead in Space ‘. and would they, either Russell T Davies have taken inspiration for deadly Christmas trees or Steven Moffat for quantum locked statues to such scary effect without these classic series influences? When Terrance Dicks stepped down from being a script editor I think his contribution to the TV series as a writer continued to be strong as ever. I love ‘Robot’, ‘State of Decay’ and ‘Horror of Fang Rock’. ‘Robot’ is based on King Kong and I really enjoy the Who stories where we look behind shady organisations with the robot programmed to struggle against its prime directive. It’s also a regeneration story and Tom Baker plays it straight and authoritative with that little bit of eccentricity that makes him quite mesmerising immediately. It’s a really well-written introduction that suits Tom Baker’s character completely. Terrance has always been a writer good in a crisis. 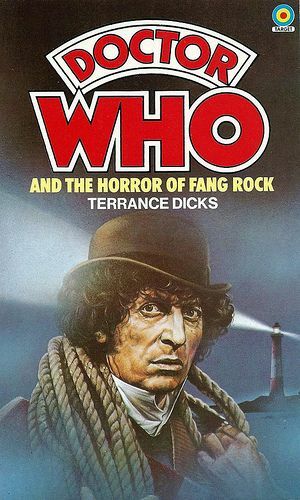 Horror of Fang Rock was a last-minute replacement from him as the vampire story he had originally planned had to be put on hold due to the lavish BBC series ‘Count Dracula’ already in production and due to transmit close to when the serial would have originally aired.He always seems to have a clear idea of the moral compass of the doctor but also knows how to write a good yarn with a twist. He obviously has a love for Gothic horror and using recognisable sources of literature and Tom Baker is so suited to playing a darker less sympathetic character in Horror of Fang Rock. The doctor is unapproachable and alien at times, offers little support to anyone despite the death happening around him yet still feels utterly compelling to watch. DOCTOR: Still, must be patient. A new body’s like a new house. It takes a little bit of time to settle in. (The Doctor sees himself in a mirror.) Oh. As for the physiognomy. Well, nothing’s perfect. 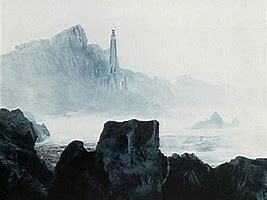 His vampire story did eventually get made as the atmospheric ‘State of Decay’ which uses the locations to create a melancholy dark atmosphere. I really enjoy it as it harks back to the Philip Hinchcliffe era in a lot of ways. “There is only the village and the tower, nowhere else ” which sets the feeling of a community with a dark secret that seems cut off from the rest of the world. Terrance Dicks sets up that the three who rule do so through fear, reputation and whispers, controlling the local population like sheep. The direction also helps create a tense brooding tone. When the 20th anniversary of Doctor Who was coming up Terrance Dicks was persuaded by Eric Saward at short notice to write ‘The Five Doctors’ after Robert Holmes withdrew from the project bemoaning the “shopping list” of companions and monsters handed to him. One thing that I really like about Terrance Dicks is he knows his characters but then he always has a great irreverent sense of humour when talking about the programme. If you listen to the commentaries on the DVD’s he is great fun to listen to. 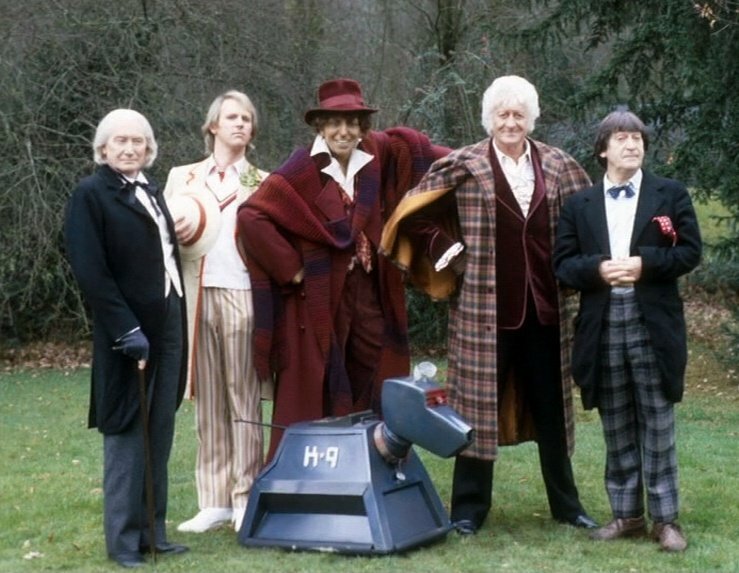 On the ‘ The Five Doctors ‘ DVD commentary ‘ he describes the result as a ‘good pantomime’ and it’s clear to see how he had to be inventive to create a good story with the number of actors to consider and a changing guest list. 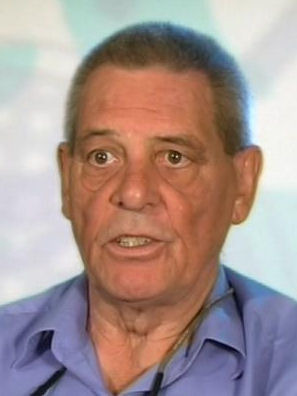 Due to his long history with the programme, Terrance Dicks managed to create an engaging narrative despite having four doctors and numerous companions to write for. When Tom Baker declined to appear at the last minute he was able to use this into the narrative as the 4th doctor was stuck unable to be retrieved which impacted the 5th Doctor as he was drawn into the time vortex piece by piece. I have always rather enjoyed his writing a more restrained Master trying for once to help the Doctor who is rebuffed at every turn. 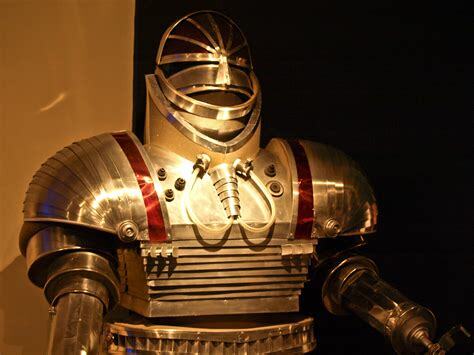 He also fought to have K9 and the Daleks included in the anniversary special which was not originally planned by the production team but is required viewing. 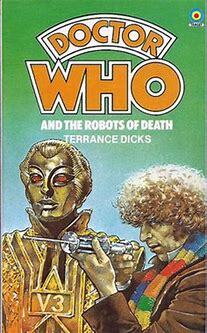 Terrance Dicks is probably the most prolific contributor to Doctor Who with over 60 Target novelisations to his name. I worked through all his novelisations and the other authors in my local library growing up before I got any pocket money to be able to afford to buy any books so Target books have a special place in my memories. 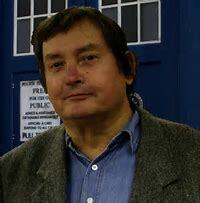 Terrance Dicks has also been the editor for the Doctor Who Target books, where possible persuading the original writers of the television broadcast to write the novel. Terrance Dicks has shown great versatility having to step in at times where this hasn’t been possible or where writers have difficulty translating for the medium.He is well known for his descriptions of the various doctors: the crotchety old man in a frock coat” (first Doctor), the “baggy check trousers and a mop of untidy black hair” (second Doctor) and the “slight, fair-haired figure with a pleasant, open face” (the fifth Doctor). There’s also the description of the TARDIS materialising with a “wheezing groaning” sound which has become legendary.. I have quite a few of the Target novelisations now from when I could afford them when I started working and it really isn’t an understatement to say I absolutely loved reading those books.This was at a time in the early 1980’s when the books were a substitute for watching the TV series as not much of the classic series was available on VHS or ever repeated.It was the only way to experience the old episodes or the missing stories so those Target books really were important in allowing your imagination to fly. Reading the books took me away to different places and I was there in those adventures. I hope anyone who hasn’t read a Target Book at some point gives them a try. There are many people who have contributed to the legacy of Doctor Who. Terrance Dicks is just one of my classic era heroes. This great man deserves so much praise from both classic fans and in the modern series and also loads of respect for how much of a contribution he has made to the TV series itself and other associated mediums. Thank you so so much ‘Uncle’ Terrance you are absolutely one of the best. Do you agree with me? What are your favourite Terrance Dicks moments in novels, TV stories, other media contributions? Post your thoughts on here or on Twitter. Let’s talk!